India’s first luxury mall, The Collection UB City Mall is a dazzling name among the list of all high profile malls in Bangalore. Situated on the CBD area of Bangalore on Vittal Mallya Road, the premier mall is just 1.5 km away from the MG Road – Brigade Road junction. This super luxurious mall of acclaimed brands, stylish boutiques and exquisite restaurants was developed by the chairman of UB Group, Dr. Vijay Mallya in joint venture with the renowned Prestige Group. Established in 2008, the mall has successfully raised the bar of style and fashion to a new level in the city. This 3 level fashion and lifestyle mall is spread over 1 lakh sq ft of area and is one of the most sought after luxury shopping destinations of Bangalore. The Collection UB City Mall truly lives up to being a luxury mall by bringing together some of the best international brands of fashion under one roof. The mall has roped in international retail giants for fashion and glamour like Louis Vuitton (one of the most powerful luxury brands of the world), Estee Lauder, Burberry, Canali, Tag Heuer and Rolex among others. The 40 nationally and internationally acclaimed brands housed at the mall offer a variety of items like exquisite jewellery, cosmetics, apparel, shoes, bags, accessories and much more. It is the place that offers the best from the global front at the local platform. The mall flaunts a touch of opulence in each and every department. It houses some of the finest attractions of Bangalore, the Amphitheatre being a prominent one among them. The huge Amphitheatre has a seating capacity of around 1000 people. Its stage dimension is of 500 sq ft. This magnificent and expansive setup has been the host of some of Bangalore’s fantastic events. Due to the frequent organisation of world class performances by national and international artists at this place, the Amphitheatre has become one of the most preferred venues to unwind and enjoy. 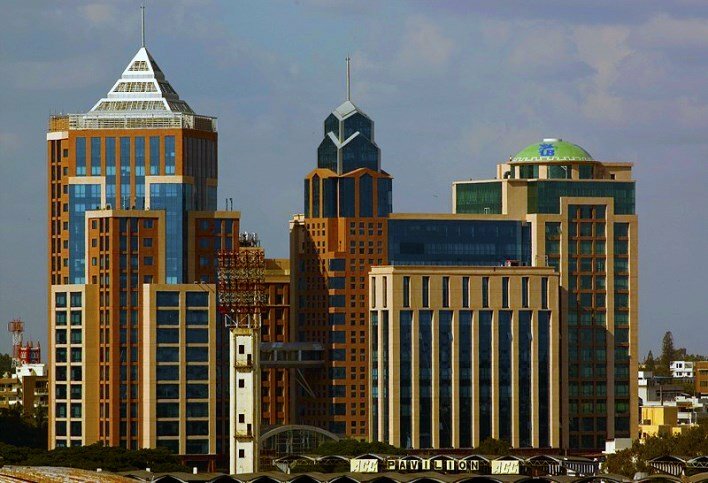 The central location and the ambiance of UB City has made the event zone an ideal choice for all sorts of events like music concerts, fashion shows, art events, designer store launches, or just about any high-profile exclusive event. It is the place that offers entertainment to the people of Bangalore like no other event zone does. The mall has evolved into one of the major fine dining hubs of the city. Its restaurants serve an array of global cuisines that allows you to relish the authentic taste of far flung lands. You can enjoy the delicacies of Royal Indian cuisine at Khansama, the specialist Indian restaurant at the mall. With a range of cuisines that are as varied as Japanese to Balinese, you will be spoilt for choice. Adding an element of excitement to the food served is the distinctive theme surrounding each restaurant. The Pizza at UB City is a real attraction for the visitors. It has been tastefully designed to reflect a street side ambiance. But the real stunner is the platter of food on offer. You can decide to have an exotic dinner of Mediterranean Cuisine at Fava or go for a colourful Indian platter at Rajdhani or try some delicious South East Asian food at Tasty Tangles or experience the beauty of European casual food at Cafe Noir or simply enjoy the flavour of American fast food at Subway or you can select your pick from several other options. If you have a sweet tooth then the mall is just the right place for you to indulge yourself. Bliss Chocolate Lounge at the mall is a wonderful destination to relish a huge range of exotic European chocolates and desserts. Its hand crafted chocolates, cakes, chocolate beverages and chocolate meals can transform you to a land of yummy delights. So, whether it is a quick bite or a fine dining experience or simply an indulgence for chocolates, the mall can fulfil all of your food fantasies to the last bite.